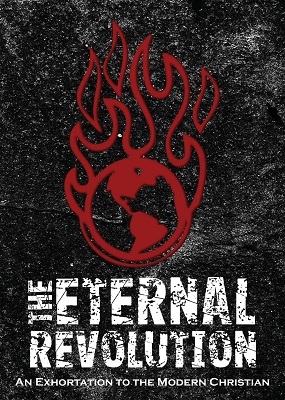 The Eternal Revolution is a call to actively engage in the Christian life as an ongoing battle for the Kingdom of Heaven in the midst of a fallen world. It provides a perspective of our faith as warfare, a perspective so old it appears repeatedly in the Scriptures themselves. This book renews the challenge found throughout the Bible to fight the good fight and live as courageous warriors of spirit. Only 40 pages long, this book is short and to the point, easy to finish once you start. It does not leave the reader with vague feelings, but with specific actions they can take to change the world and bring about the fire upon the world Jesus said He came to bring. Available as an ebook for $2.99 from Amazon. Paperback copies are $6 each, but 10-packs are available for $30 direct from the publisher – a perfect solution for small groups, churches, and those who cannot wait to share the call with others.